About halfway through the first season of The Flash, Barry Allen (Grant Gustin) and Caitlin Snow (Danielle Panabaker) went out for a night of karaoke in Central City. And that was the night we remembered that Grant Gustin had been a character on Glee, and had a terrific singing voice. Of course, the guy playing his surrogate father, Jesse L. Martin, initially shot to fame in the original cast of RENT, so you know, there are some serious pipes on The Flash. As there are also on Supergirl. Star Melissa Benoist was also on Glee, while supporting cast members Jeremy Jordan and Laura Benanti barely have time to be on a network series with their busy lives as Broadway stars. It seems to have been part of executive producer Greg Berlanti’s strategy: though most people may not realize it, one half of Firestorm on DC’s Legends of Tomorrow is also famed for his history in musicals. Victor Garber played Jesus in the 1971 film adaptation of Godspell, and played John Wilkes Booth in the original cast of Stephen Sondheim’s infamous but briliant Assassins. With all that talent, it’s long past time that these shows do a musical episode. Even Buffy the Vampire Slayer did one. 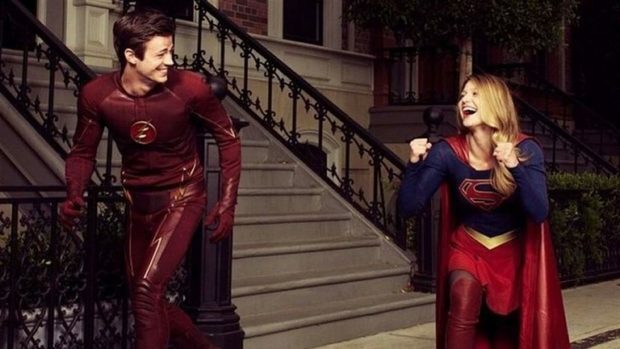 At the Television Critics Association Summer Press Tour today, Berlanti announced that the dream will become a reality: the great CW superhero musical is coming, in a crossover between Supergirl and The Flash in the second half of this season. In other news for the CW’s Arrowverse, The Flash will be facing both Dr. Alchemy and Savitar (another speedster) this season. And over on the actual Arrow, Dolph Lundgren will be appearing as… a taciturn Russian. You know, I interviewed him once, and he’s actually quite a fun conversationalist. He didn’t threaten to break me once.